Ingeleiv Berstad, Ida Wigdel and Kristin Helgebostad are ready to enter the forest. With unconditional intensity and bodily devotion they dedicate themselves to the night sides of human existence. Noise is the vibrating energy, the uncontrollable, dissonant forces accumulating in and around us. Visual, auditory, physical. From expansive landscapes to the narrowest corners of the mind. Noise is not the exception; it is the rule. Noise is. Spoiler is noise. The visible and invisible, audible and inaudible impulses disturb, intensify, elude and reveal. These impulses, these spoilers, demand that we listen with the body, ready to move deeper into the forest. Noise is silence. 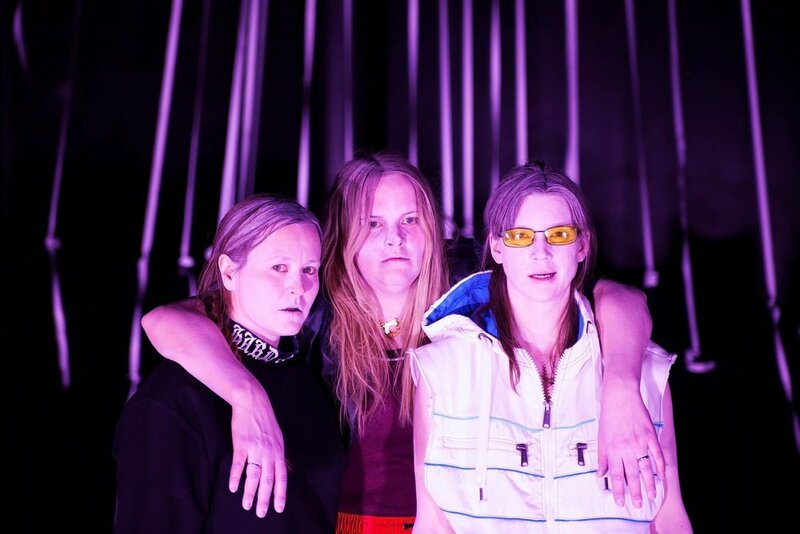 Spoiler is the newest production by the trio Ingeleiv Berstad, Ida Wigdel and Kristin Helgebostad. The strength of their artistic relationship encourages their exploration of a playful, intuitive way of working in which no idea is too hysterical, vulgar, provocative or childish to investigate. Spoiler premiered 22.nd of february 2017 at Black Box Theatre in Oslo. Touring includes MDT, Stockholm and Flora Theatre Festival in Olomouc. Se Touring for upcoming dates.